Fes is one of the four imperial cities. It means that is used to be the capital of the kingdom of Morocco during a certain period. Nowadays it is considered to be the spiritual and cultural heart of Morocco, due to the great number of mosques that can be found in the city. We will start our private tour in Fes early in the morning, so we would have more time for exploring the city. We will start from medina. It literally means “an old part of the city” and usually there are concentrated most of the monuments of the city. We will walk along the narrow maze-like streets of medina. It is worth noting that due to the fact that all the streets in the old part of Fes are very narrow any kind of transportation is prohibited there. It is not allowed even to ride a bicycle or use a motorbike. But anyway the sellers need something to carry their goods to the souks – Berber markets – and they use donkeys, as it was centuries ago when there were no cars or motorcycles. 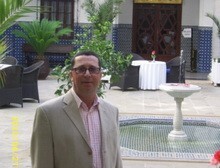 As your private guide in Morocco I will be telling you all the interesting facts about Fes, and about Morocco in general. We will definitely visit the royal palace, which is famous for its marvelous seven bronze gates. We will proceed to the el-Nejjarine Square, with its beautiful Plaza, caravanserai and various artists. I would strongly recommend you to visit the Fes el Bali, which was labeled as the World Heritage Site by UNESCO. We will definitely visit such places as Bou Inania Madrasa, University of al-Qarawiyyin, Dar al-Magana, Ibn Danan Synagogue, Al-Attarine Madrasa and others.